I am loving the fact that our new hometown has so many bakeries. In case you haven’t noticed, I pretty much love bread, pastries and all things carb. 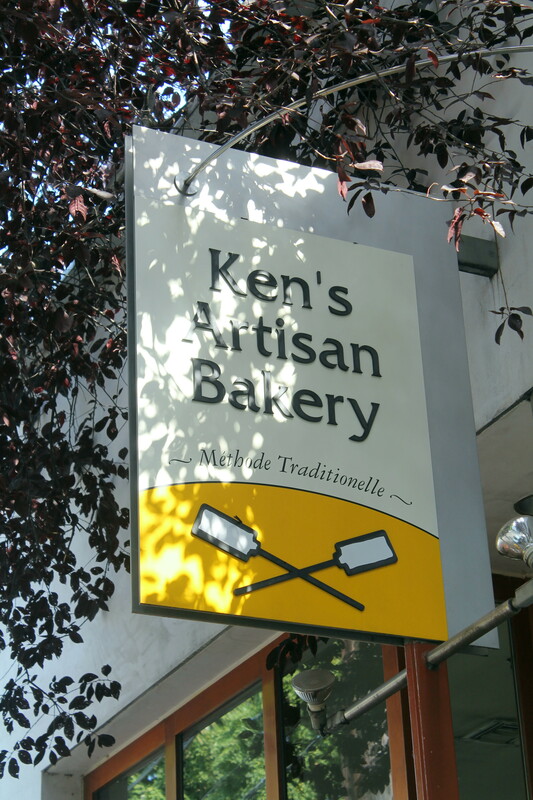 Around noon today my husband and I took the MAX train into Portland for lunch at Ken’s Artisan Bakery. The bakery is located at the corner of NW 21st & NW Flanders. Ken also has an artisan pizzeria at SE 28th & SE Pine and a new book that’s just come out. One can never have too many cookbooks. Lunch is served daily from 11 am to 3 pm. 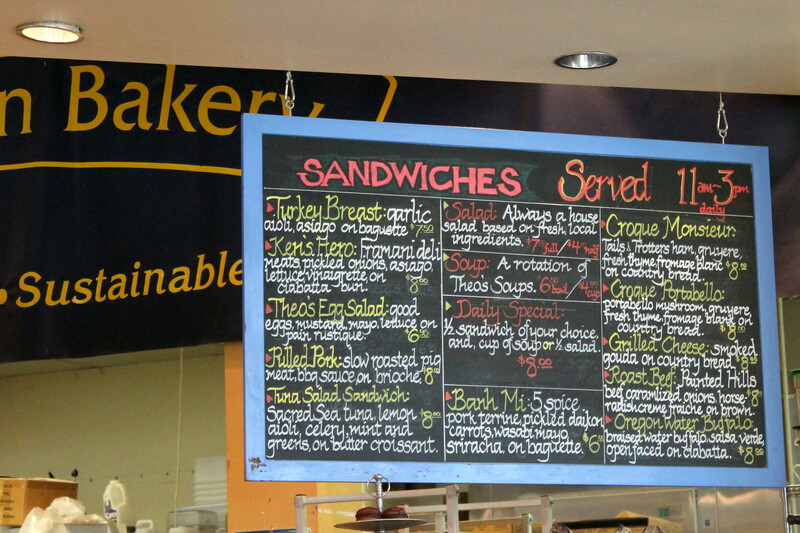 The daily choosings are prominently featured on a large chalkboard sign upon entering, with additional pastry selections featured in glass cases. 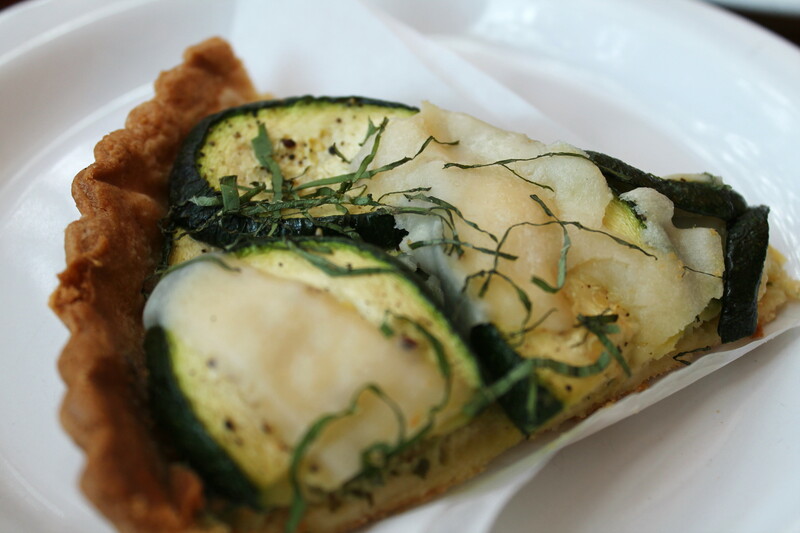 I opted for a zucchini and goat cheese pastry with a light creamy-pesto spread. The photo below is pretty close to the actual size. It is the perfect light meal or snack for someone who is saving room for dessert. The husband chose a roast beef sandwich. While he enjoyed it — especially the bread — he later said he wished he would have gotten the pulled pork. If I ate pork, I would have opted for the banh mi and I was also curious what the “Oregon Water Buffalo” sandwich entailed. 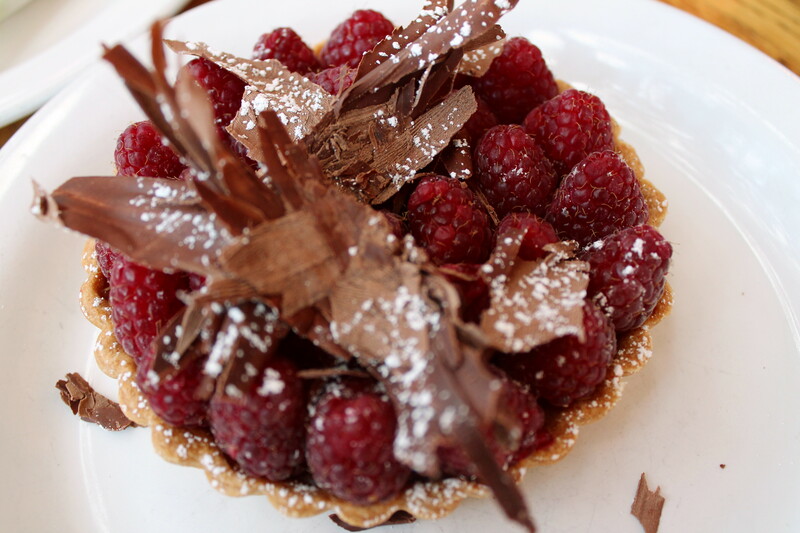 For dessert, we shared this raspberry-chocolate tart. It was awesome in every way. The berries were especially fresh and the thin layer of chocolate didn’t make it overly filling. Ken’s also has a nice selection of Stumptown Coffee and looseleaf tea. The husband had a vanilla latte and I was adventurous and tried the Lavender-Chamomile tea, which was also quite good. The bread selection also looked impressive, especially the 3-kilo boule pictured in the top right in the below photo. 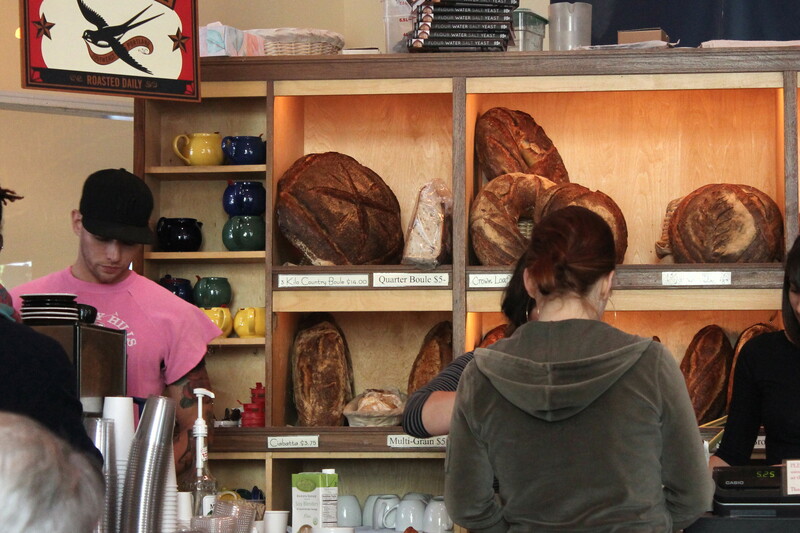 Other bread options included classic baguettes, ciabatta, multi-grain and walnut bread. Service was fast and the food was reasonably priced for the quality. We got all of the above food for just over $22. 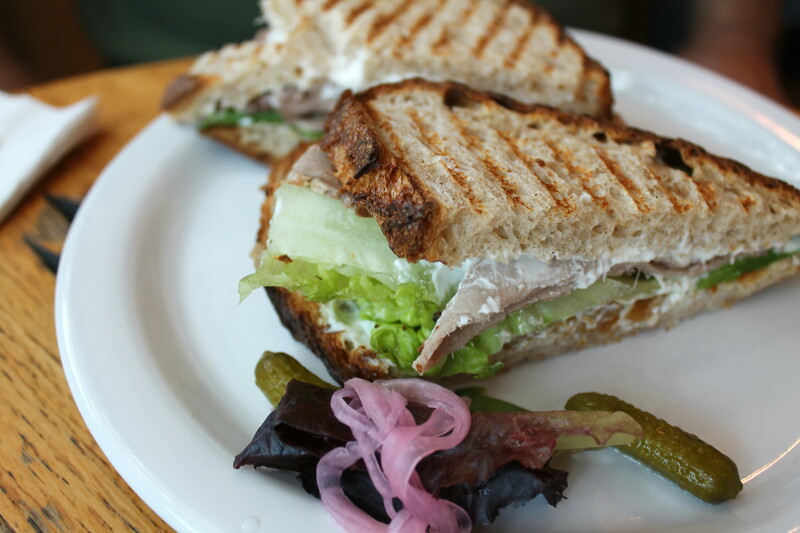 This entry was posted in Oregon, Restaurant Reviews and tagged bakery, bread, lunch, Oregon, Portland, restaurant reviews, sandwiches. Bookmark the permalink. We’re definitely going here when Mike and I visit! Sounds good! You’re welcome anytime.